Recipes — Good Food Makes Me Happy! Curry, lemon, and tarragon is a perfect marriage of flavor and the raisins add another surprising note. Since I have been limiting dairy, I used soy cheddar cheese shreds. This casserole is pretty forgiving in the type of vegetable or cheese that you may have on hand. 1 lemon — zest half the lemon, for 2 tsp. and juice to get 1-1/2 T.
In a medium saucepan, bring salted water to a boil, add the vegetables and cook for 2 minutes. Drain, rinse with cold water, and leave in the colander to dry. In a bowl, mix the chicken with 2 tsp. curry powder, 1/2 tsp. salt, and some freshly ground pepper. Melt 2 T. butter in a large saute pan on high heat and fry the chicken for 1 minute on each side until browned. Do this in batches if your pan isn’t large enough to hold all the chicken without crowding. Remove chicken and set aside. Melt 2 T. butter in the saute pan on medium-high heat and fry the onion, stirring occasionally, for 8 minutes until soft. Stir in the garlic and remaining teaspoon of curry powder and fry for 2 minutes. Add the half ‘n half, chicken stock, raisins, lemon zest, lemon juice, tarragon, 1/2 tsp. salt and 1/4 tsp. pepper, and cook for 8 minutes until the sauce has thickened. Return the chicken to the pan with the vegetables and half of the cheese. Stir to coat, then pour into a 8x12” baking dish. Put the panko and remaining cheese into a bowl. Melt the remaining 2 T. butter and pour over the panko and cheese, mix and sprinkle evenly over the chicken casserole. Bake for 25 minutes. Serve hot with rice. What a perfect meal! I had to post each of the recipes so you can also enjoy this delicious menu. A homey, warming dish, the cinnamon chicken is a good choice for a casual supper and definitely tasty enough for company. I served it over gluten free chickpea macaroni noodles accompanied by a tossed Greek salad. Mini baklava bites with a scoop of your favorite ice cream round out the meal. Serves 4-6. Pat chicken dry with paper towels. In a small bowl mix the ground cinnamon, salt and pepper, then rub all over the chicken pieces. Heat 2 T. oil in a large Dutch oven over medium-high heat and cook chicken for 3-4 minutes on each side. You may have to do this in two batches. Don’t crowd the chicken or it will steam instead of getting a good sear. When browned, remove from pan and set aside. Add the onions and minced garlic to the pan and cook about 3 minutes, stirring constantly, until onions are softened and golden brown. Add the wine and stir to get up any browned bits on the bottom of the pan. When the wine has evaporated, about 5 minutes, stir in the tomato paste until mixed, then add the water, 2 whole garlic cloves, and the 2 whole cinnamon sticks. Return the chicken to the pan; the liquid should cover about three-quarters of the chicken. Reduce heat to low, cover, and simmer for 1 hour. Taste and add more kosher salt or pepper if needed. Serve over noodles or rice, sprinkled with plenty of grated Myzithra cheese. Freeze any leftover sauce, or use it to top pasta or chicken for lunch the next day. Cook the beans in a pot of boiling salted water for 4 minutes. Drain, rinse under cold water, and pat dry with paper towels. In a blender or mini processor, combine the red wine vinegar, garlic clove, shallot, mustard, oregano, thyme, and basil and puree until smooth. With the machine running, slowly add the olive oil. Season with salt and pepper. In a large bowl, combine the blanched green beans, tomato halves, red onion. and crumbled feta. Toss with the vinaigrette and serve immediately. Preheat oven to 350-degrees. Put the pistachios, walnuts, and almonds on a baking sheet and toast in the oven for about 8 minutes. Let cool slightly and add to a food processor with the lemon zest, 3 T. sugar, cinnamon, salt, vanilla, and melted butter. Pulse to combine. Take the frozen phyllo shells and place in a mini cupcake pan. If you don’t have a mini cupcake pan, place on a parchment lined baking sheet. Add 1 tsp. of the nut mixture into each shell. Bake at 350-degrees for 10 minutes. Meanwhile, in a small saucepan over medium heat, add the water and honey and bring to a boil. Reduce heat to a simmer and cook until reduced and slightly thickened, about 8-10 minutes. Pour 1 tsp. syrup into each phyllo cup and allow it to soak in. Repeat with another 1 tsp. Refrigerate at least 5 hours or overnight. Serve at room temperature. Keep the phyllo cup packaging to store any leftover baklava bites. Makes 30. Cioppino is such a versatile dish – you can add any type of seafood that you wish (as long as it's fairly firm, like scallops, salmon, halibut, grouper, haddock – and shellfish). 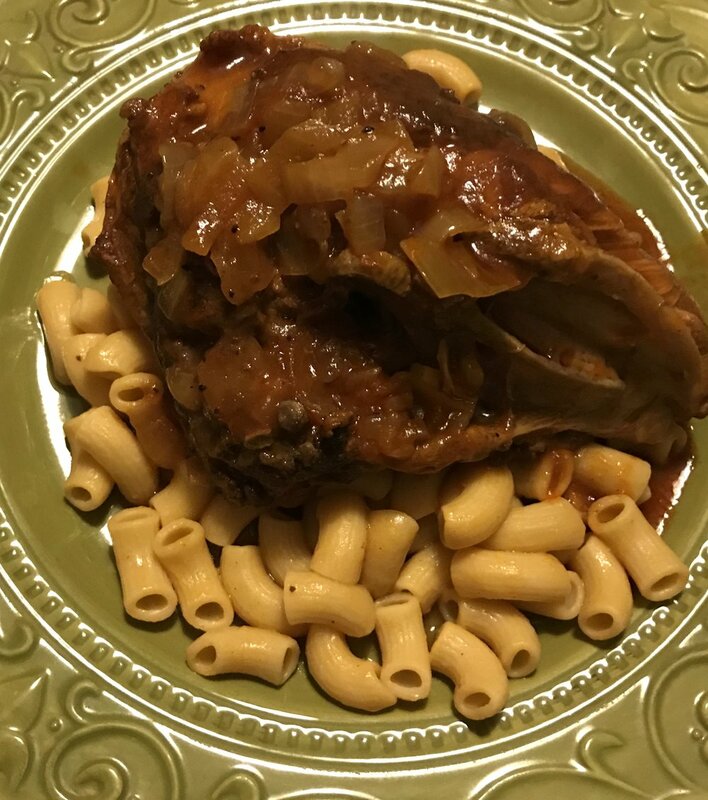 The sauce has a great depth of flavor but doesn't overpower the fish. It's a perfect main course for weekend company. You can make the stew (minus the seafood) up to two days ahead, bring to a simmer and add the fish as noted below. Be sure to use a big pot! Heat the oil in a large dutch oven over medium heat. Add the fennel, onion, shallots and salt and saute until the onion is translucent, about 10 minutes. Add the garlic and red pepper flakes and saute 2 minutes. Stir in the tomato paste and paprika until everything is coated. Add the tomatoes with their juices, wine, fish stock, bay leaf and thyme. Cover and bring to a simmer. Reduce heat to medium low, cover and simmer about 30 minutes. Remove the thyme. Add the clams and mussels, cover and cook about 5 minutes, until the clams and mussels begin to open. Add the shrimp and fish. Simmer gently, uncovered, until the fish is just cooked through and the clams are completely open, stirring gently, about 5 minutes longer. Stir in the lemon zest. Season to taste with more salt and red pepper flakes if needed. Ladle into bowls and garnish with parsley and freshly squeezed lemon juice. 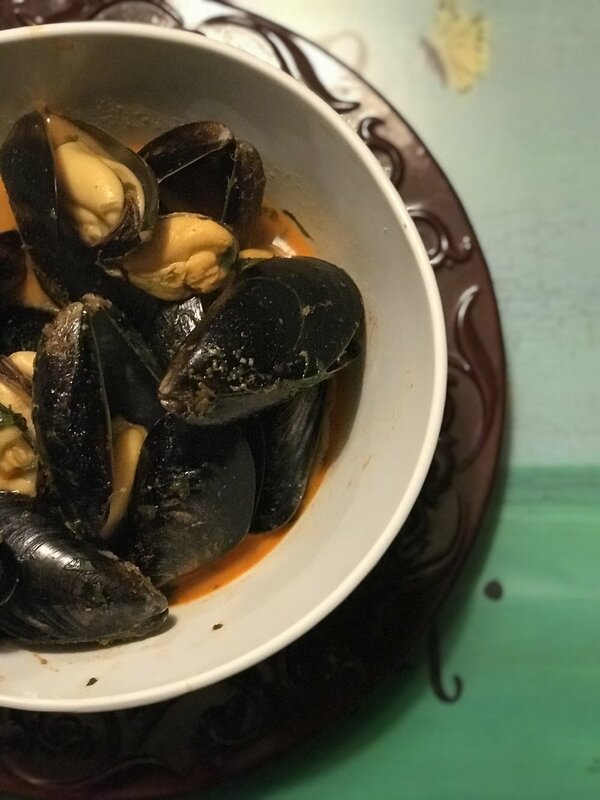 After a delightful day of wine tasting, the perfect accompaniment to a great bottle of Oregon Pinot Noir is this tasty recipe for fresh mussels. The broth has the perfect amount of spice, not too hot and lots of nuanced flavor. For the second course, consider Jacques Pépin's Frisée aux Lardons, followed by a cheese course with crackers and fruit. In a saucepan, heat the oil until shimmering. Add the lemongrass, curry paste, wine, coconut milk, fish sauce and lime juice. Bring to a simmer, stirring. Add the mussels, cover the pot and let steam until opened — about 8 minutes. During the last minute of cooking, add the chopped basil and cilantro. Remove the lemongrass before serving. Transfer the mussels to 4 bowls, discarding any that didn't open. Pour the sauce over the mussels, and serve with plenty of bread for dipping. I must admit that I have never cooked with Thai red curry paste, so I thought I'd give it a go ... and I'm glad I did! Delicious. I was a bit cautious and added just one tablespoon, but I think I could have safely added 1-1/2 or 2 tablespoons. You could also add some chicken, or experiment with additional veggies (spinach, red pepper, etc.). As you can see below, I had just baked some yummy pumpkin cake donuts, but that story is for another time! Heat oil in a large saucepan over medium heat and fry the onion for about 5 minutes until softened. Stir in the red curry paste and garlic to coat the onions and cook for a minute. Add the butternut squash and beans, stir well, then add the coconut milk and stock, stirring to combine. Bring to a bubbling simmer, then turn heat down to a low simmer and cook for 20 minutes until the squash is tender and the sauce has reduced a bit and thickened. Stir in the pineapple and cilantro and cook for another 5 minutes until the pineapple is warmed through. Serve over rice and sprinkle with some more chopped cilantro. Serves 4. I rarely get the chance to have fresh Alaskan halibut, but tonight was the night! What a great pairing - prosciutto and halibut, seared in a hot pan and finished off in the oven over a bed of perfectly seasoned veg. The zest of a whole lemon is added to the pan just before the brussels sprouts and kale and it makes all the difference, lending a tart depth of flavor along with the garlic and chile flakes. Enjoy! Preheat oven to 375-degrees. Sprinkle the halibut with salt and pepper. Lay 2 slices of prosciutto on a flat surface, slightly overlapping. Place a halibut fillet at the end of the slices and roll up. Repeat with remaining fillets. Heat the oil in a large ovenproof skillet over medium-high heat. Sear the halibut to brown the prosciutto for about 1 minute per side - your pan should be nice and hot. Remove to a plate while you cook the veggies. Quickly stir the garlic, lemon zest and chile flakes into the pan, add the brussels sprouts and kale and saute until tender, about 8 minutes. Season with salt and pepper. Stir in the couscous, hot stock and currants. Place the fish on top of the mixture and transfer to the oven. Bake for 18-20 minutes until couscous is cooked. Remove fish from the skillet, fluff the couscous with a fork and serve. – Katie Lee, Food Network's "The Kitchen"